In another first for the South African green-building sector, Solid Green Consulting has been awarded the first 6-Star Green Star SA Interiors v1 certification for the company’s offices in Rosebank, Johannesburg. The project has also been nominated as a finalist in the Highest Rated Building category of the Green Building Awards (Green Building Convention, 26–28 July 2016). Located on the second floor of an existing mixed-use commercial building on Tyrwhitt Avenue, the 180 sqm premises have been designed to accommodate 15 employees in a 120 sqm double-volume studio space, with an additional interlinked 60 sqm workspace and boardroom at mezzanine level. The public facilities – a meeting nook and kitchenette – lead onto an outdoor terrace on the southern side which is used as a chill-out and entertainment zone. We spend about 90% of our time indoors, either at work in our offices or at home. It is therefore only logical that we should focus more on how these interior spaces can support our healthy living by improving the air quality of our indoor spaces. 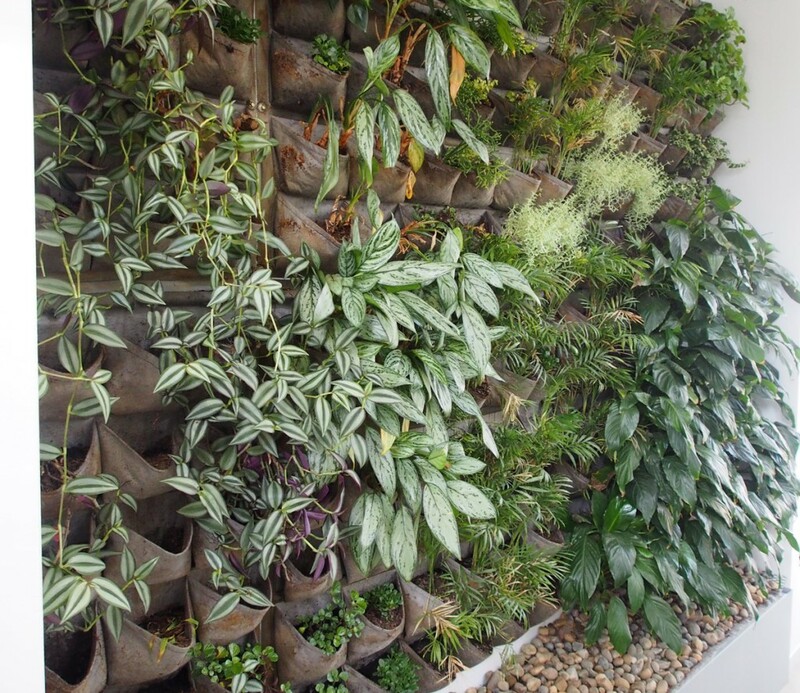 There is also a growing recognition of the benefits of including biophilia in our building designs, which centres around the fact that humans have an innate attraction to nature. Connecting with nature reduces stress, enhances creativity and improves well-being. 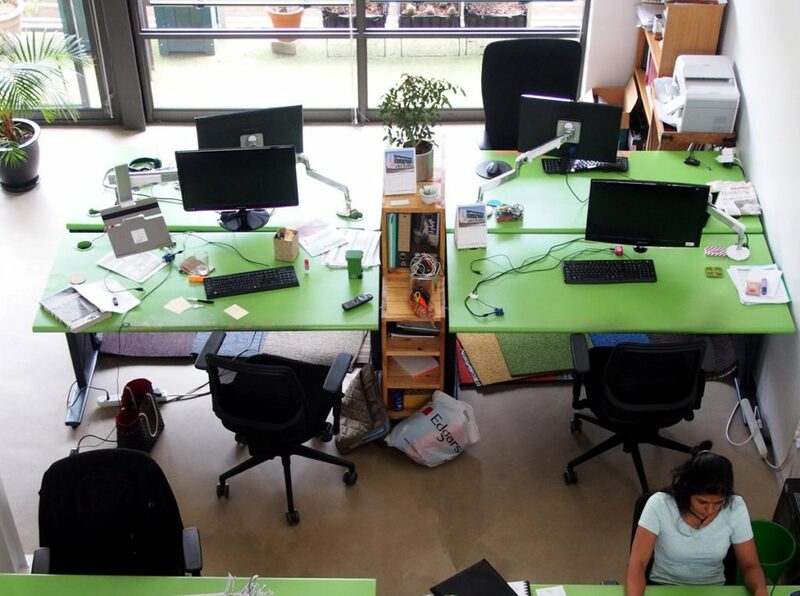 Research suggest that workers in office environments with natural elements report a 15% higher level of well-being; and are 6% more productive, and 15% more creative. This philosophy is carried throughout the spaces with indoor and outdoor planting: a green wall leads from the entrance into the main workspace; plants are located through the open plan work areas; succulents form sculptural elements along the north-facing balcony overlooking the street; and small-scale urban farming is planned for the open-air terrace. 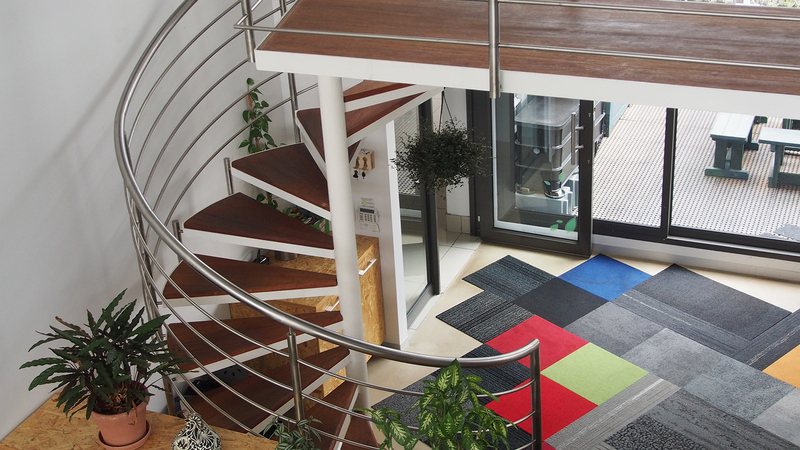 The company’s signature green is also subtly incorporated into various furnishings and fittings, giving the spaces a bright, attractive quality; and the staircase connecting the entrance and mezzanine levels is a lightweight, sinuous vertical element. For maximum energy efficiency, radiant cooling and energy-efficient equipment (laptops and printers are Energy Star rated) have been specified. All light fittings are energy efficient LEDs with occupancy sensors; and a 1.8 kW thinfilm solar PV system has been added to the roof, which takes the office to net zero energy on an annual basis. Rainwater tanks and water-saving fittings are planned, as well as rainwater harvesting for irrigation of the exterior vegetable garden. A key feature of the refurbishment was the installation of Solid Green’s own Solid Insight – a software platform that generates accurate live-metering data that can be accessed from any device with an internet connection. By integrating with the office’s smart-metering systems, the application enables automated billing for energy and water consumption, while environmental reporting is also handled automatically. 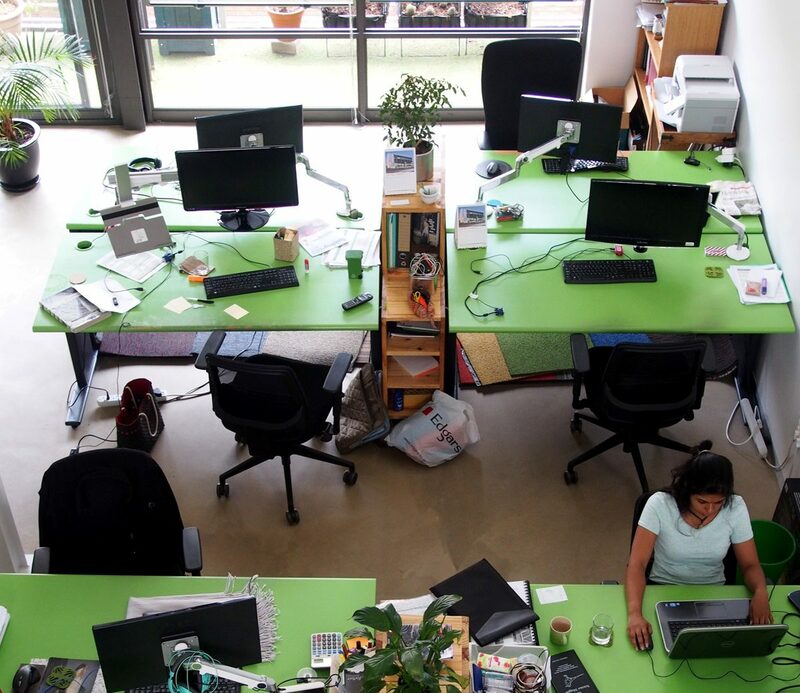 All office furniture is reused or refurbished, with the exception of a few new ergonomic office chairs. Anglo American donated 20 desks following their own refurbishment; the boardroom tables were bought at an auction; and the boardroom chairs from antique stores. 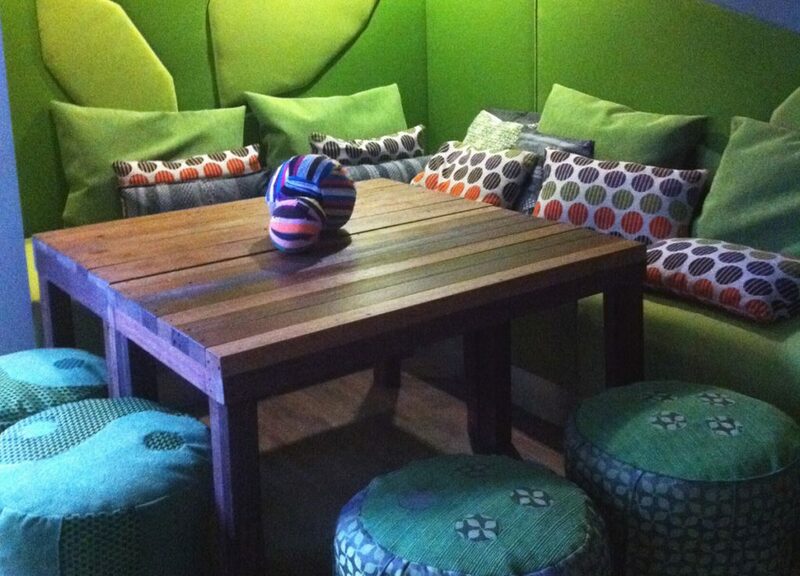 Feature seating (foops) in the meeting nook was made from recycled 2-litre plastic bottles and recycled partitioning material, while the love-seat bean bag was made from upcycled T-shirt materials. As the offices are centrally located in Rosebank, Solid Green’s employees have easy, walking-distance access to public transport, including the Gautrain Rosebank Station, taxi rank and bus station. In addition, the company’s senior management have ensured that alternative transport modes are also available during office hours. These include: an electric car and electric bicycles with charging facilities; car-sharing; and cyclist facilities with a shower. “Solid Green is one of the initiators of the Decongest Sandton movement and so there is a big push for our staff to minimise private car use and explore alternative modes of transport,” Reinink emphasises. We are currently in the process of setting up an incentive programme for the staff to encourage non-private car use. As our own client, it has been insightful to understand the cost implications of creating a more sustainable space. We have learned to keep a close eye on what is actually happening on site, and to establish processes to minimise change. We understand that there is always time pressure involved with projects and with interior projects even more so – and we therefore encourage our clients to allow for as much design time as possible. By achieving such a significant milestone for green interiors in the redevelopment of its own offices, Solid Green has succeeded in demonstrating, once again, its commitment to sustainable building design, practice and innovation.